The Ombre hair color is the hottest trend in spicing up your locks of hair. It usually features darker hues at the roots with gradually-dyed lightening at the ends. Some prefer to go with bolder colors on the end or even reverse ombre. 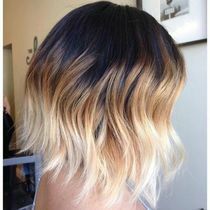 Ombre is a VERY easy look to do badly. Colorists need a strong skill set as the technique required to make it blend nicely can be hard to master. In addition, you need a great color line that allows the colorists to create the perfect blended hue. Our skilled stylists will help you rock this glamorous look and help you select the perfect effect for your hair and skin colors, whether it be subtle or bold, blonde or red, or even tri-toned. You can add just a hint of a subtle hue difference or you can go wild with bright red or pink ends. ​Ombré hair color is one of the most popular and most requested Colorado Springs hair color techniques today which continues to grow in popularity. Ombré Hair Color is a gradual fade from dark to light color, or vice versa (reverse Ombré); by definition the word Ombré means "having colors or tones that shade into each other". 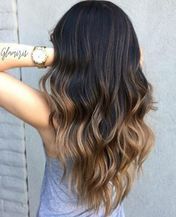 Rather than starting the color at the roots, an Ombré hair color is darker at the roots to the midshaft, then it is gradually lightened from the midshaft to the ends, which is usually achieved by using a Balayage coloring technique.